The American mink has been known for its beautiful fur. For hundreds of years, it has been trapped for its winter coat of fur. The animal also has been raised on mink farms and introduced into other countries throughout the 1900s. They have escaped from farms and populated many areas of the world. Minks have waterproof, dark brown fur. Their length is between 1 to 2 feet. Their bushy tails add another 6 to 8 inches. Minks only weigh between 1 to 3 pounds. They have a white patch under their chins. Their paws have claws. Their feet are partly webbed which makes them good swimmers. They have a slender body with short legs. Minks mate during the winter months of February and March. After 45 to 52 days, 4 or 5 young kits are born in the mother’s fur-lined den. They are blind and without fur. After about 6 weeks of feeding from mother’s milk, they are taken on a hunting trip. Mother teaches her babies how to hunt and will protect them to the death. At the end of summer, each mink leaves home to mark a territory. Minks mark an area with a scent that smells as bad as a skunk’s scent. However, the smell does not carry through the air as far. Minks stay in an area for about 10 months, then move on to mark a new area. Minks live for about 3 years. Minks set up homes near rivers, streams, creeks, lakes, and marshes. 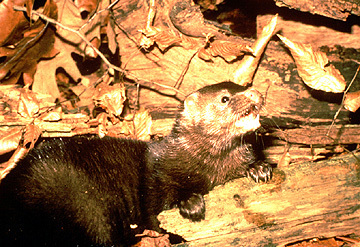 Within their marked territories, minks make several dens in hollow trees or burrows left by other animals. They can burrow under rocks and tree roots. Sometimes, they dig tunnels under the snow. They live alone unless it is the mating season. They purr like cats when happy. Minks hunt at night or on very cloudy days. They hunt on land and in water. They are a very fast moving animal. In or near water, they hunt for frogs, fish, birds, and crayfish. On land, they will hunt for rabbits, snakes, birds and their eggs, and other small rodents such as mice. Minks are carnivores. If a mink kills more than it can eat, it keeps the food in its den for a later meal.